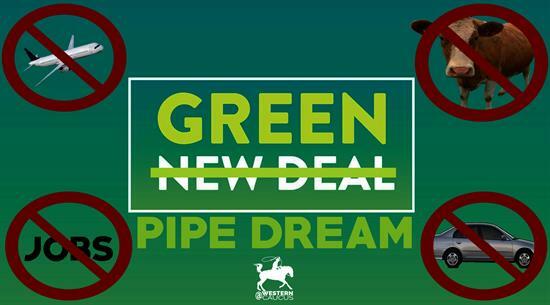 Chairman Paul Gosar (AZ-04): "The Green New Deal is another climate change, socialist pipedream that attacks American jobs and our way of life. This extreme proposal revealed today seeks to end domestic flights on airplanes, remove non-electric vehicles from our streets, give more money to those that are unwilling to work, put union bosses in charge of all new energy jobs, eliminate nuclear power and fossil fuels, get rid of cows, as well as provide universal healthcare, housing and education. Democrat socialists made clear today that they want to use climate change as a means to abolish capitalism and implement massive taxation, expropriation and government control. This bill and the accompanying FAQs page are so detached from reality that they are already trying to blame ‘farting cows and airplanes’ for unrealistic emissions goals 10 years away. The problem with socialism is that you eventually run out of other people's money. The problem with the Green New Deal is that the sun doesn’t always shine, the wind doesn’t always blow and with a nearly $22 trillion debt, we don’t have any more money to borrow to pay for this exorbitant fantasy." On February 7, 2019 the framework of the Green New Deal was unveiled at a press conference with Rep. Ocasio-Cortez (NY-14), Senator Markey (MA) and a few of their colleagues.